Recent release “Uncommon Life” from Page Publishing author Timothy Goodyer is a richly woven story following Ederic, the orphaned peasant son of Ederant from the shire of Eder, who rises from his lowly station to become the king of England’s most trusted warlord toward the end of the first millennium—but there remains a debt to a stranger from his past that led to this uncommon rise, which might cost him everything to repay. 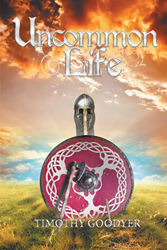 Timothy Goodyer, a lifelong reader and first-time author born in Chicago, Illinois, grew up in Michigan, and lives in Waukesha County, Wisconsin, has completed his new book “Uncommon Life”: an epic period war novel with an unlikely hero. Published by New York City-based Page Publishing, Timothy Goodyer’s new book is an ultimately inspiring one that also captures the imagination in its rendition of old England at war. The story of Ederic’s rising beyond the position he was born into and the tragedies and debts he incurs along the way up accurately depicts, too, what it can take for one to change one’s destiny. Readers who wish to experience this dramatic work can purchase “Uncommon Life” at bookstores everywhere, or online at the Apple iTunes store, Amazon, Google Play, or Barnes and Noble.